He visited Samsung medical center complaining of fever and dizziness. He has been diagnosed to have lung and brain abscess at the local hospital. He had been treated with pulmonary tuberculosis a few years ago. Fever was checked and breath sound was decreased at right upper lung field. Neurologic examination Motor power of left lower leg decreased to level 3. Aspergillus species was observed on special stained specimen. 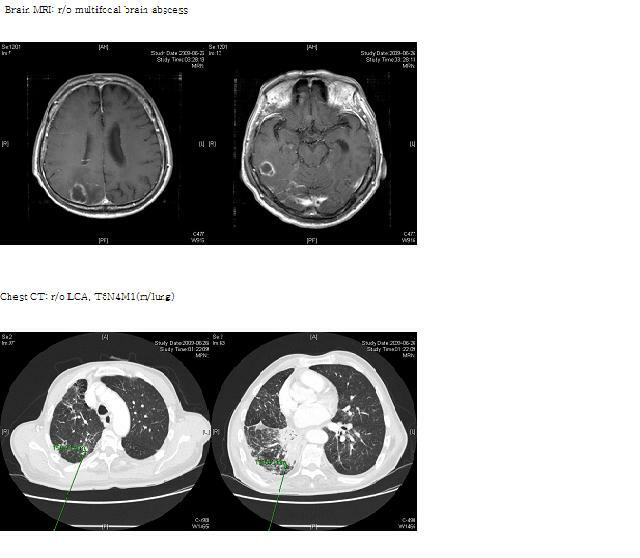 He was diagnosed as cerebral and pulmonary invasive aspergillosis in immunocompetent host. Since 1st case report of cerebral aspergillosis in an immunocompetent host described in 1986, about 30 cases have been reported worldwide. Before the introduction of voriconazole, amphotericin B was treatment of choice in cerebral aspergillosis and most of patients died despite high dose amphotericin B administration with 90% mortality rate. In 2004, successful treatment with voriconazole was introduced showing improving survival in ICU patients. Treatment with voriconazole for definite or probable CNS aspergillosis enhanced clinical outcomes and improved survival rate about 31%. Recently published IDSA guideline recommended voriconazole as primary treatment of choice in cerebral aspergillosis rather than other antifungal agents. For the definite diagnosis of cerebral aspergillosis, pathologic specimen should be obtained from brain tissue. As adjunctive diagnostic tools, both Galatomannan assay and chest CT provided effective diagnostic yield for an early diagnosis and preemptive treatment in immune-compromised hosts with IPA, especially neutropenic patients. However the role of Galactomannan assay has been rarely exploited for the diagnosis of invasive aspergillosis in immunocompetent host. Combination therapy with voriconazole and caspofungin was associated with reduced mortaliy in small population study. Further study with large population is promising for convincing evidence of combination treatment in patients with invasive aspergillosis.